Mirrored Pyramid Makes an Octahedron. Look at a square based pyramid. An upside down pyramid can form an octahedron with it. See picture below. Now do this with the Great Pyramid of Egypt. The featured picture shows such a blueprint. See the featured picture. It is an excerpt from page 16 of my Staff of God, Volume II. First, what is the Great Pyramid of Egypt? The Great Pyramid of Giza (also known as the Pyramid of Khufu or the Pyramid of Cheops) is the oldest and largest of the three pyramids. They are in the Giza pyramid complex bordering what is now El Giza, Egypt. It is the oldest of the Seven Wonders of the Ancient World. Also, it the only ancient wonder that remains largely intact. Feel free to read these two internal links. As will can see, I have written on subjects for quite a number of links. 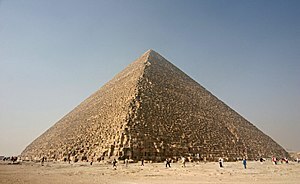 The Great Pyramid of Egypt is quite a puzzle..
Now for the my most recent blog. An octahedron is the complete intended construct of the Great Pyramid of Egypt. The basis of a lost Golden Age was the 3 x 3 number square. It has countless hidden number codes. They were once understood and activated. An example of its use is in the featured picture. The radius height is 275 shorter Egyptian cubits. That radius has a circumference of 1728 cubits. Note the 3 x 3 number square gnomon. As pictured, 8 x 3 x 4 x 9 x 2 = 1728. The core number of the 3 x 3 number square is 5. The 5 cubit tip is missing from the tip. This blog shows its number square source. Circle’s diameter of 550 cubits is also numbered by the 3 x 3 number square. DSOworks.com gives ample instructions for discovering lost number codes. 55 is the average of any two opposite numbers as 49 + 61 = 110. They average 55. Similarly, you can find 110 in 16 different ways on this square. Zero as in 550, was not a recognized as an actual number. On the 3 x 3 number square it is a composite. It is the sum of any two sets of opposite numbers.